Very nice information, in fact, I had a severe headache. With dizziness. A glass of citron juice with a pinch of salt immediately relieved my headache. That was due to the pith. Cheers to the citron lime. And nice to know so many benefit it has. I’m really happy to hear that citron juice helped you. The fruit is surprisingly healthy and rich in important nutrients, so its juice shares its benefits too. And thank you for sharing your headache relief solution with us. I’m thinking of trying it too next time I get a headache. Such an informative article. Thank you for posting! Just finished the Jewish holidays, where Citron was used. Heard about the medicinal properties and wanted to do something with a few of them. I opened them up and noticed that very little juice would come, so I food processed the whole fruit and cooked it up with water and some honey. Just checking to make sure its ok to drink a bit since I guess was quite concentrated (depending on how much water one added). I strained it and put the juice away in containers and also froze some. Since I have never worked with citron, is all this ok to consume? The whole rind was processed and cooked. Please answer. Thank you so much. Hello, Esther. It’s ok to cook and eat the thick white inner rind of the fruit. You can also candy it in sugar, pickle it, make it into jam. You can use the inner rind to flavor various dishes. I’m sure it was delicious the way you cooked it. Can this citron juice help in weight loss and melt the fat inside the body? I’m too fat that’s why I’m asking. I’m expecting the helpful reply. Hello, Mohammed. Citron and citron juice can help you lose weight if you incorporate them into your diet, but you have to pay attention at all the other things you eat as well. It’s the whole diet that matters if you want to lose weight. Losing weight is 70 or 80% about what you eat, how much you eat and how you eat. For example, if you have a glass of citron juice, a plain yogurt and some plain oats cereal in the morning, then continue with some grilled chicken and a salad in the afternoon and some boiled cod or other fish in the evening with some lemon juice and a drizzle of olive oil, then you can lose weight. You can eat a fruit or two in between meals or some nuts or seeds as a snack. This is how you need to eat if you want to lose weight: small meals and clean, simple eating. Food has to be fresh, simple, low in fats, but also nutritious to keep you healthy. When I wanted to lose weight, I changed my eating completely. Nothing processed, no baked goods, no cookies, no biscuits, no candy, no cooking with butter or margarine, no frying, no white bread, no chips, no croissants, nothing already processed and ready to eat and reduced my salt intake considerably. This is how I avoided hidden calories, fats and a lot of unhealthy preservatives, not to mention water retention. You can see a dietitian and have him or her give you a detailed meal plan or simply eat healthier food prepared at home. The simpler the dish, the better. I lost an extra 12 kilograms by eating plenty of vegetables, some fresh fruit when I had a craving for something sweet, moderate amounts of whole grains, raw, unsalted nuts and seeds as snacks and moderate amounts of eggs, fish and chicken. I made sure I ate whenever I felt hungry and the more natural I ate, the more energy I had and the better I felt both physically and mentally. If you want to lose weight, you have to change your diet, not just incorporate citron juice in it. 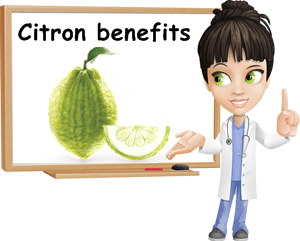 You can drink citron juice as part of a healthier diet to include a greater variety of quality foods that will help you maintain a healthy weight and good health. Wishing you lots of health. We’ve got some Citrons growing. Can we make a juice of the entire fruit (rind, pith and all) and drink it raw with some seasoning? Hello, Nirmala. It would be best to make citron juice from pulp and pith and you can drink it raw. Personally, I like my citrus fruit either plain or with a bit of peppermint for flavor, but you can flavor it with anything you may like, really. The rind is inedible, although we may tolerate extremely small amounts like a bit of citron zest for flavor (similar to lemon zest). You can however make candied citron rind or a great citron rind jam or citron rind marmalade. After all, the pulp with its juice and the pith are the parts of the fruit which hold the most nutritional value and provide the most benefits. The rind not so much in the form it is present in the fruit because there is the issue of not being able to digest it properly and without this, you can’t absorb antioxidants or other nutritional elements. Also, remember that it’s best to always make the juice fresh and drink it right away. Juicing extracts nutrients and makes more easy to assimilate but, at the same time, it leaves them more vulnerable to light and other external factors. The longer a juice if left to sit, the more antioxidants it loses. Hope this helps. Honey citron and ginger help for loose weight and good for diabetic? Somebody give me review, please. Hello, Kamel. Honey is basically just concentrated natural sugars (glucose and fructose mainly, the same two simple sugars that make up table sugar). If you are diabetic, eating honey will raise blood sugar levels, so it’s best avoided. You can still have a taste from time to time, but nothing more. As for weight loss, no, honey doesn’t promote weight loss. Citron is a good citrus fruit, overall healthy and it doesn’t cause weight gain because it’s relatively low in calories. But it doesn’t help you lose weight by itself either. All of your diet is important when you try to loose weight, not just one food. As for diabetes, citron is neither particularly good, nor bad. It’s a fruit so it’s best eaten in moderate amounts, but has plenty of vitamin C which helps with wound healing in diabetes. To my knowledge, citron rind is what most people eat from the fruit. The rind is cooked and candied, so it’s full of sugar. If you are a diabetic, it’d be wise to avoid candied citron rind, citron rind jams and products like these. Lastly, while ginger does have some effects on diabetes such as reducing fasting blood glucose levels and initiating mechanisms that allow for weight management, anti-inflammatory activity, these effects are minimal. Not to mention that the amounts required to produce any visible effects may be too much for some people and cause side effects of the likes of acid reflux, heartburn, hemorrhoids upset etc. In other words, while studies show ginger holds some beneficial activity with regards to type 2 diabetes, it is not a cure for diabetes. Diabetes is a disease of the metabolism. One food will not reverse it or cure it, be it honey, citron, ginger or others. Instead, the diabetic person needs to eat healthy overall and limit their intake of carbohydrates per day and per meal to prevent excessive blood sugar rises and the side effects that come with them. If you are diabetic, see your doctor or a nutrition expert for a personalized eating plan that includes recommendations for daily carbohydrate content and carbohydrate content per meal. Exercising and taking the medication your doctor prescribed you are just as important as eating right. Hope this helps and wishing you lots of health!